The fire-starters are outside loading up the oil drum with kindling. The MC is making final preparations and the choir are settling in to make sure that they have firmly in their minds how all the bits of the modern rite of the Easter Vigil fit together (not easy) and I have done the last edit for my sermon. We have four catechumens to be baptised and I have heard 75 confessions during the Great Week to prepare to rejoice in the resurrection of Christ. A great festival is almost upon us. There has been much to ponder over the past few days and I have been reading many blogs, ruminating on various opinions expressed, and forming some thoughts in my own mind which may mature enough for me to think they might be worth sharing in due course. 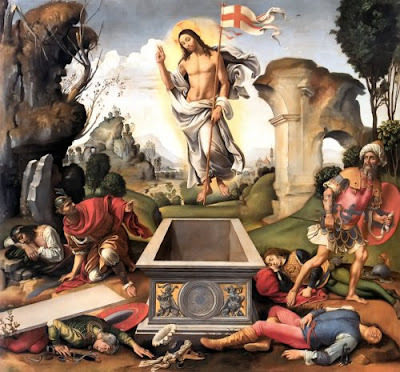 In the meantime, let us rejoice because Christ is risen indeed. We have life in Him through our Baptism, the "bath of regeneration" (Titus 3.5) and continually through our communion with the Church of Rome founded on the rock which is Peter. Let us rejoice and be glad. Alleluia!